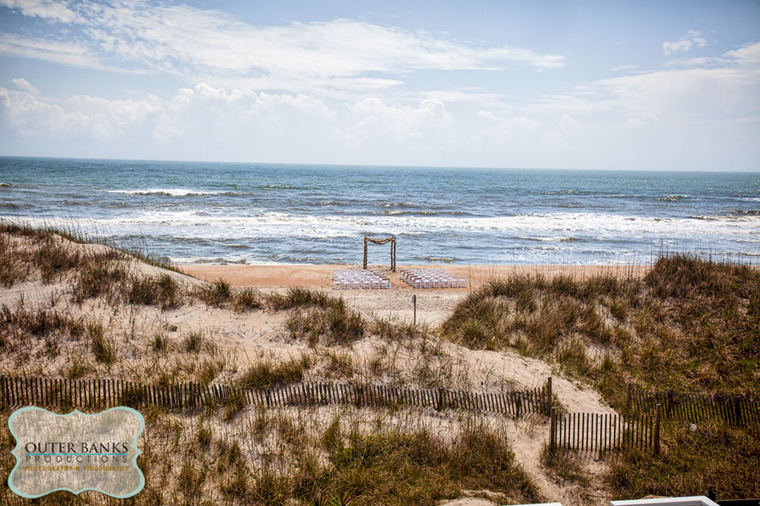 Amanda & Nick were married in April on Hatteras Island on a beautiful stretch of beach in front of Jekyll’s Hideout. The house is amazing with huge decks, gorgeous views, a lot of room and a nice yard for a reception. It was a close call with the weather that week but everything turned out perfectly. We always tell our couples not to worry about the weather until just a couple of days before the wedding. The weather is always changing on the Outer Banks. We started the day with Doug photographing the groomsmen getting ready and some portraits and I photographed the bride getting ready and a portrait session with the bridesmaids. We had a wonderful first look before the ceremony to help take away some of the stress from the busy day. After the ceremony we had a wonderful portrait session. It is always important to make your photographer a family portrait list. Not everyone’s family dynamics are the same. This will help everything to move quickly. Talk to your photographer to find out how to best organize your list. Also, be careful how many pictures you ask for. Portraits take time. Make sure you allot your time wisely. A long list can make for a long day. After a super romantic portrait session with the couple the bride bustled her dress on the beach and the bridal party was announced into the reception. It was a wonderful reception filled with romantic dances, toasts, fun, family and friends. I am so glad and blessed to be an Outer Banks Photographer. I get to meet so many wonderful couples and their amazing friends! We were able to work with Samantha for her bridal portrait session last night. The weather was looking a bit grim but we changed locations to avoid the rain and wound up with an amazing sky instead! Here is a sneak peek of Samantha’s session. In the end the clouds moved in. It only made the session more beautiful! It was the perfect day. We started our day with a first look of the bride and groom on the docks by the salon. Stephen got to see his stunning bride before the big day went into full swing. As I took pictures of the bride and groom with their bridal party and some romantic pictures on the dock Doug was able to get some beautiful images of the reception and ceremony site. It is always good to make sure that everything is already set up before your photographer arrives. This is so important if you want pictures of the room as well as the tables and details. It is also important that the ceremony site be set up before guests start arriving if want to make sure your photographer gets this important shot. After the portraits the bridal party freshens up while we headed to the ceremony site to get pictures of the guests arriving. After the ceremony we headed to the beach for family photos and a few more bridal party and romantic shots while Doug photographed the cocktail hour details and guests. After our session on the beach we walked over to a little dock to the south of the Sanderling where our couple and bridal party boarded a boat to get to the gazebo on the sound side. It allowed the bride and groom to enter from the sound side into the pavilion for their introductions.The rest of the night was topped off with great food, fun and a lot of dancing! Our bride shared some information about their special day. See what she wrote. I am from Pittsburgh, PA and Stephen is from Topsail Island, NC. We are currently living in Alexandria, Va.
Stephen works for PEPCO Electrical Company and I work for the federal government. We met at a local establishment in San Francisco where we used to live. Stephen asked me to marry him on top of the Marin Headlands overlooking the Golden Gate Bridge near where we lived. It is a beautiful view of the city. 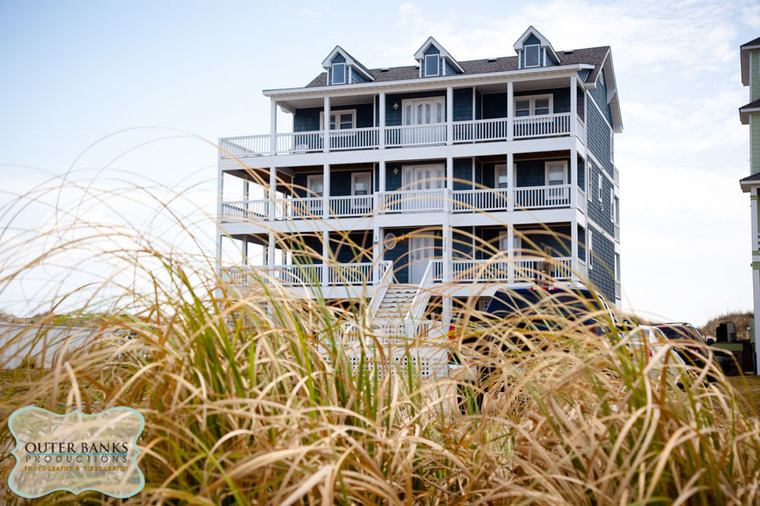 We chose the Outer Banks for our wedding because Stephen is from North Carolina and loves the beach and I visited the Outer Banks a few years back and really enjoyed it there. Our colors were tan, violet, mint, and yellow. I got my dress at a small dress boutique in Walnut Creek, CA. My favorite part of the day was seeing how happy my parents were and spending time with friends and family. 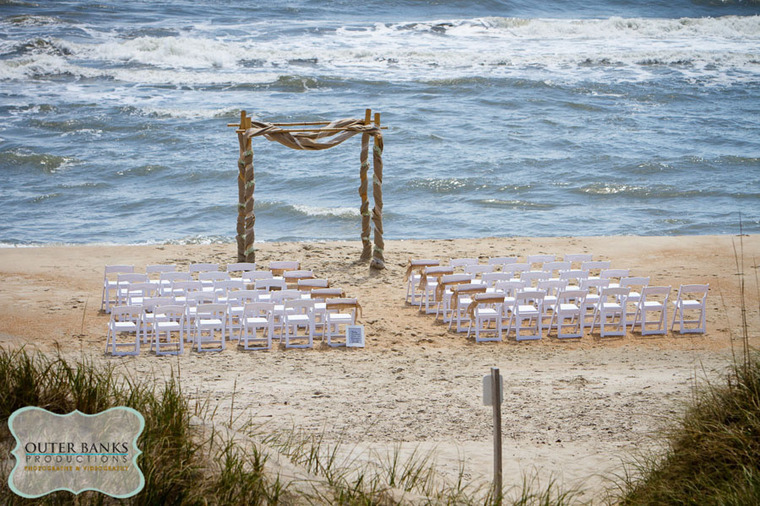 It was easy to plan a destination wedding. The hardest part was the hotel and sleep accommodations for guests. Destination weddings can get very pricey and you typically need to book rooms in advance which most people don’t like to do. The best part of a destination wedding is that I got to be at the beach for an entire week. The wedding goes by so fast, so it was great to get a beach house with my bridesmaids and spend time with them before and after the wedding. I also took pictures with the bridal party and had a “first look” before the wedding which I liked because it helped move things along between the wedding and reception. Our dinner service was served early which I also think is important because it allows more time for dancing. It was also very convenient that you could just walk from the ceremony to the reception. I wouldn’t have changed anything about our wedding day.